Taste test: These are good barbecue chips, with a tasty and spicy flavor. They've even got some kick to them in the aftertaste. 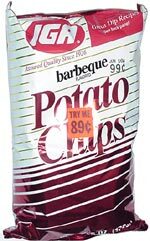 Trivia: IGA spells it "barbeque" on the bag, not "barbecue" like it says in the dictionary.